Eddystone Reef, the underwater area surrounding the famous Eddystone Rocks and accompanying lighthouse, was, for many years, regularly trawled. The scallop beds are now protected. But, as with most marine protected areas, financing the area’s recovery – including ongoing research and data capture – proved a challenge. Eddystone Reef is now the focus of a unique conservation partnership between Princess Yachts and the Marine Conservation Society (MCS). The former has taken on custodianship of the local reef, offering MCS the financial support it needs to help secure the reef’s future. The partnership is having a positive impact – both on the reef and the marine life that calls it home. 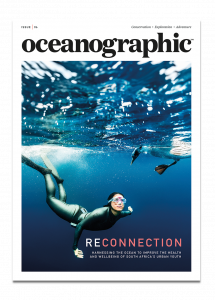 You can read more about the conservation of Eddystone Reef in Issue 02 of Oceanographic Magazine, including insight from some of the UK’s elite freedivers who experienced the reef first-hand.